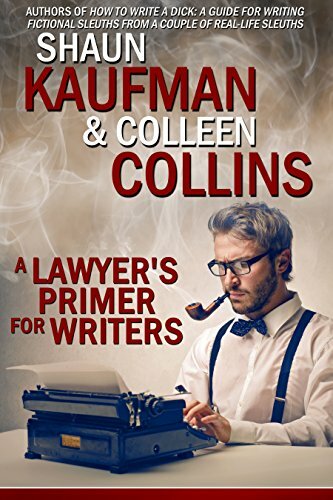 For the next few posts, I'll be sharing sections of the chapter "The Steps of a Trial, From Jury Selection to Verdict" from A Lawyer's Primer for Writers: From Crimes to Courtrooms, a nonfiction book written by my husband, Shaun Kaufman, and myself. Since we co-owned a private investigations firm for over a decade, Shaun has returned to the practice of law, specializing in criminal defense, family law, and personal injury. I currently work as an investigator for Shaun Kaufman Law and several other law firms, as well as write fiction and nonfiction. For today, we'll touch on some history, then list common trial terms. Yes, figure 28 shows a pig, the defendant, in a trial. Throughout Europe, from the Middle Ages into the nineteenth century, animals could be tried in court for crimes, exactly the same as humans. The trials were conducted formally: Juries were selected, witnesses testified, evidence was admitted and so on. Lawyers were appointed, at tax-payers’ expense, to represent the animals. So kicks off our discussion on the formal steps of a trial, which like a story has a beginning, middle and end. Let’s begin with an alphabetical listing of common trial terms. Accessory: A person who knowingly and intentionally contributes to a criminal act (before or after the crime, but not necessarily during the commission of the crime). An accessory after the fact is someone who knows that a crime has occurred and helped to conceal it. Acquittal: A finding by a judge or jury that a criminal defendant is not guilty of the charges brought by the government. An acquittal is not a declaration of the accused's innocence but rather it is a verdict based on the prosecution’s inability to prove the accused's guilt beyond a reasonable doubt. A person may be acquitted of a crime but found civilly liable in a civil case regarding that same crime because civil cases have a lower burden of proof than criminal cases. Admissible: A term that describes evidence that may be heard or seen by a jury and/or considered by a judge or a jury in civil and criminal cases. Answer: The formal written statement by a defendant in response to a civil complaint. The answer establishes the grounds for defense. Bench Trial: A trial without a jury, in which the judge alone weighs the facts to reach a decision. Bench Warrant: An order issued by a judge for the arrest of a person. Beyond a Reasonable Doubt: The standard required to convict a criminal defendant of a crime. The prosecution must prove the guilt so that there is no reasonable doubt to the jury that the defendant is guilty. Burden of Proof: The level or quality of proof that a party needs to prove his or her case. In civil cases, the plaintiff has the burden of proof by a preponderance of the evidence, which means the plaintiff’s proof must outweigh the defendant’s at least slightly for the plaintiff to win — if the two sides are equal, the defendant wins. In criminal cases, the prosecution has the burden of proof, and must prove the defendant's guilt beyond a reasonable doubt for a guilty verdict. Capital Offense: A crime punishable by death. Challenge: An objection, such as when an attorney objects at a hearing to the seating of a particular person on a civil or criminal jury. Circumstantial Evidence: All evidence except for eyewitness testimony. One example is physical evidence, such as fingerprints, from which an inference can be drawn. Closing Arguments (see also Opening Arguments): Also called closing statements, summation and summing up, which are the concluding statements by both parties at the end of a trial. A closing argument may not contain any new information and must refer to evidence already presented throughout the trial. Usually the plaintiff gives the first closing argument, and the defense is second. In some cases, a judge's presentation of the jury instruction is also known as summing up. The only cases that can be won in the final argument are those that have not been previously lost. On the other hand a good case can be lost in those fatal, final moments. Contempt of Court: Willful disobedience of a judge's command or of an official court order. A person who is in contempt of court can be fined or jailed. Conviction: The result of a criminal trial which ends in a judgment or sentence wherein the prisoner is guilty as charged. Corroborating Evidence: Supplementary evidence that strengthens or confirms the initial evidence. Counsel (also called counselor): A term that refers to the lawyers in a case. Counsel is often used as a plural; counselor as singular. Cross-Examination: The questioning of a witness by the other side. Direct Evidence: Proof of facts by witnesses who saw acts done or heard words spoken. Direct Examination: The first questioning of witnesses by the party on whose behalf they are called. Exhibit: A document, photograph or object introduced as evidence during a trial. Expert Witness (also referred to as professional witness or judicial expert; see also Non-Testifying Expert). Someone who has the knowledge, training, skills or educational background to present their opinion about evidence or a fact in a legal case. Hearsay: Statements by a witness who did not see or hear the incident in question but heard about it from someone else. Hearsay is usually not admissible as evidence in court. Hostile Witness: A witness whose testimony is not favorable to the party who calls him or her as a witness. Hung Jury: A jury whose members cannot agree on a verdict. Impeachment of a Witness: An attack, via evidence, on the believability of a witness. Inadmissible: That which, under the rules of evidence, cannot be admitted or received as evidence. Inadmissible evidence cannot be considered by a judge or jury in considering their verdict. Judgment: The final disposition of a lawsuit. - Consent Judgment occurs when the provisions and terms of the judgment are agreed on by the parties and submitted to the court for its sanction and approval. - Default Judgment is a judgment rendered because of the defendant's failure to answer or appear. Jury Instructions: Rules that the judge reads aloud to the jury before their deliberations begin. These instructions explain the law that applies to the case the jurors have just heard, and their role in deciding the facts of the case. Leading Question: A question suggesting the answer that the questioner — the defense lawyer or prosector — desires of the witness. A party generally may not ask one's own witness leading questions. However, leading questions may be asked of hostile witnesses on cross-examination. Mistrial: When a judge throws out a verdict. When a mistrial is declared, the trial must start all over again, beginning with jury selection. - Motion in limine: A request to the judge to prevent certain pieces of evidence from being brought up during the trial. These requests are typically made when the jury isn’t present, often before the jury pool is even brought into the courtroom, so that jurors are not influenced by evidence that is improper or irrelevant. The phrase in limine is Latin for at the threshold, so a motion in limine symbolizes the stopping of certain evidence at the door of the courtroom before it gets inside and infects the case. - Motion to compel: A request that the court order a party to a court case or a third person to do something, such as produce documentation or other evidence, or it might be a request to sanction the other side for failing to do something. Motions to compel are frequently used to settle disputes that arise during discovery, such as when one side refuses to turn over documents. Motions to compel must include a promise that the person or attorney previously made a good-faith attempt to resolve the problem before asking the court to intervene. - Motion to dismiss: A legal document that requests the court to throw out a case, typically filed by the defendantafter the plaintiff has filed a complaint. Non-Testifying Expert (see also Expert Witness): Either side in a case can hire an expert whose role is to help the attorney evaluate something in the case. For example, a plaintiff in a civil case might hire an electrician to test if the electrical wiring in a vehicle was faulty. This type of expert is protected from discovery (unlike an expert witness whose identity and documents are discoverable). Opening Arguments (see also Closing Arguments): Also called opening statements, which are the introductory statements made at the beginning of a trial by each side. It offers a summary of the case to the jury, including case facts and legal theories, as well as the anticipated proof that will be presented throughout the course of the trial. Some studies claim that 80 percent of jurors' verdicts are based on the opinions they form after hearing opening arguments. Overrule: A judge's decision not to allow an objection. Also, a decision by a higher court in finding that a lower court decision was in error. Parole: Serving the remainder of one’s sentence outside of prison under the supervision of a government agency. Preponderance of the Evidence: Greater weight of the evidence, the common standard of proof in civil cases. Probable Cause: Guaranteed by the Fourth Amendment, probable cause is the standard used by a police officer to make an arrest, obtain a warrant or conduct a search. Probation Officer: The court-appointed officer who supervises criminals on probation. Relevance: Testimony and evidence presented at trial must be relevant to the case. Restitution: A monetary payment ordered as part of a judgment in negligence and/or contract cases to restore a loss. In criminal cases, it may be one of the penalties imposed and may require return of stolen goods to the victim or payment to the victim for harm caused. Restitution is often a condition of probation or a reduced sentence. Summing up: See Closing Arguments. Suspended Sentence (see also Sentence): After a judge issues a sentence at the conclusion of a case, he/she may then make it a suspended sentence, which means the punishment is delayed as long as the defendant fulfills certain conditions, such as community service or attending a substance abuse program. Judges often enter suspended sentences if they believe a defendant has a high potential to be a productive citizen. However, if a defendant violates the terms of a suspended sentence, the judge can impose that the original sentence, such as incarceration, be fulfilled. Verdict: The jury’s formal decision after a trial. Although most verdicts are upheld by the judge presiding at the trial, the judge also has the discretion to set aside a verdict under certain circumstances. Also, the number of jury votes required to render a verdict differ for criminal and civil cases. Verdict Form: Question-and-answer forms, often in paper format, designed to aid jurors in reaching a verdict after a civil or criminal trial. These forms are not the same as jury instructions, but instead are guidelines to help the jury determine if legal standards have been met by the facts in the case. Each side in a case creates its own verdict form, tailored to its precise case details, and then submits these forms to the judge before trial. Because lawyers write verdict forms with maximum benefits to their side of the case, the judge will meet privately with both sides to combine their forms into the final verdict form that the jurors will actually use. Therefore, the final verdict form a jury receives is typically the result of compromise from both sides. Voir Dire (which means to speak the truth). The jury selection process. Witness List: A list of witnesses a party expects to call to testify at trial. Each party must submit a witness list to the other side. Witnesses might be someone who observed a crime, who worked for a business that is part of the trial, a friend or family member of the defendant or plaintiff, or a police officer. Next post will be about selecting a jury and opening arguments. Today my husband was at the Arapahoe Courthouse. He passed by the courtroom where the James Holmes trial is taking place, and in the hallway were two courthouse dogs, a black lab and a Schnauzer. Several children and adults would occasionally hug or pet the dogs, who are specially trained to provide comfort to witnesses and others. I first learned about courthouse dogs while writing the nonfiction book A Lawyer's Primer for Writers: From Crimes to Courtrooms. I was writing a section on players in the courtrooms when I stumbled upon an article about courthouse dogs (AKA therapy dogs). I had never heard of such dogs being used in the court system before, so I researched their history and learned how the concept began, which dogs are a good "fit" to work with victims of crimes, the work a trainer does with the dog and victim leading up to a trial, and much more. Below is the write-up from the book on courthouse dogs. Did you know that as of the writing of this book, there are 60 courthouse dogs (also called facility dogs and advocate dogs) working in 23 jurisdictions throughout the US? What Is A Courthouse Dog? These are specially trained dogs that provide emotional support to people who have suffered physical, psychological or emotional trauma as a result of criminal conduct. For example, a courthouse dog might offer comfort to a sexually abused child while he/she undergoes forensic interviews and testifying in court. These dogs will also greet jurors; offer a soothing presence for vulnerable witnesses; provide a sense of normalcy during emotionally charged court hearings; even cuddle and play with troubled teenagers waiting for hearings. Courthouse dogs truly become a member of the court as they often visit with court support staff, defense counsel, law enforcement officers and judges during the course of a work day. Criminal justice professions — such as a deputy prosecutor, law enforcement officer, victim advocate, or forensic interviewer — handle courthouse dogs. Reduced blood pressure and/or heart rate. Increased levels of a relaxation hormone. Decreased levels of stress hormones. A greater control of one’s life. Let’s look at the story of a courthouse dog named Rosie. In 2011, Rosie, an 11-year-old Golden Retriever, had her first day on the job as a courthouse dog. Before a court proceeding began, Rosie met Jessica, a 15-year-old girl who would be testifying in court about being raped. Rosie and Jessica took the stand before the trial began so the jury wouldn’t see Rosie and possibly be influenced by her presence one way or the other. Throughout her testimony, Jessica petted Rosie — at one point, Jessica removed her shoe and buried her toes in Rosie’s fur. When asked by the prosecutor to point out the man who raped her, Jessica froze. Rosie, sensing Jessica’s distress, laid her head in the girl’s lap to comfort her. After a few moments, Jessica was able to point to the man. Jessica and Rosie had been visiting each other for three months in preparation for Jessica’s trial date. During that time, the girl and dog had become acquainted by playing together, and Rosie had also learned how to tolerate the tight space of a witness box. Her handler would have Rosie sit in front of a barrier that the handler gradually moved closer to the dog until it mimicked being in a box. The training paid off. With Rosie’s help, Jessica remained calm during her testimony, and the jury found the defendant guilty. Rosie had started out being trained to be a service dog at Educated Canines Assisting with Disabilities (ECAD), but when it took her three months to learn how to turn on a light, she was taken out of the program. What’s interesting is that such “service dog drop-outs” often go into other programs, such as training to be an arson or courthouse dog, for which they might be better suited. Soon after Rosie’s left the service-dog training program, she began visiting the Green Chimneys school in Brewster, New York, where she showed a talent for soothing children who were stressed. For the next eight years, Rosie moved onto the speech-and-occupational-therapy rooms at Green Chimneys, where children were encouraged to talk to Rosie via 80 verbal commands the dog knew. Rosie also aided the children during their physical therapy by encouraging them to follow her over obstacles. And then she went to the Courthouse Dogs Foundation, where she was trained to work with children during court proceedings. Sadly, Rosie passed away in 2012, but her legacy lives on through her younger sister, Ivy, who is now an in-house therapy dog at a children’s facility. All rights reserved by Colleen Collins. Any use of the content (including images owned by Colleen Collins) requires specific, written authority. Other images are licensed by Colleen Collins, who does not have the authority to distribute to others.